The $115 million first close was led by a number of leading (mostly unnamed) institutional investors across the U.S., Europe and Asia, including new anchor LP Trusted Insight. A number of well-known European entrepreneurs also invested. They include Taavet Hinrikus (co-founder of TransferWise), Alex Chesterman (co-founder of Zoopla) and EF alumnus Rob Bishop (who co-founded Magic Pony Technology, which was bought by Twitter for a reported $150 million in 2016). This new fund — which EF says is one the largest pre-seed funds ever raised — will enable the talent investor to back more than 2,200 individuals who join its various programs over the next three years. EF currently operates in Bangalore, Berlin, Hong Kong, London, Singapore and Paris. This will translate to the creation of around 300-plus venture-backed companies, three times the number of startups it has helped create since EF was founded by McKinsey colleagues Matt Clifford and Alice Bentinck all the way back in 2011. As part of the same announcement, EF says that General Partner Joe White has relocated to Silicon Valley, where he’ll focus on growing EF’s investor network on the West Coast. Perhaps the move shouldn’t come as a total surprise — White is the husband of Wendy Tan White, who was recently recruited by Alphabet’s X (formerly Google X) in Mountain View — but either way it feels like a smart move from EF’s perspective, as the talent investor, which is also backed by Reid Hoffman’s Greylock, seeks to create further ties to Silicon Valley. EF is also sharing some data with TechCrunch, revealing for the first time numbers related to the number of EF graduating startups that have gone on to raise outside capital. For the 2015 “vintage” cohort, there were 16 seed rounds, eight Series As and now two Series Bs. For 2016, 24 seeds and five A rounds so far. For 2017, 41 seeds and two A rounds. And for 2018, 57 seeds and one Series A already. TC: You’ve announced the first close of a new fund — $115 million. What is the remit for the fund and how does it fit into the broader EF program and funnel? Is it mainly for follow-on funding so EF doesn’t get too diluted for the most promising companies it helps create? MC: As far as I know, you have to file the hard cap with the SEC, but that’s not a target. This is a first close, not a final close, but with $115 million we can fully fund all six sites for three years, which is great. Certainly having Reid and others involved has helped a lot, but EF is just generally a very different beast from when we closed the last fund: the portfolio is now valued at well over $1.3 billion; we’ve had $300 million of exits; the fastest growing alumni companies have been funded by some of the best VCs in Europe and the US, etc. So across the board we had a lot more to show. TC: EF began life calling itself a “talent-first” investor based on the EF program recruiting potential founders pre-team and pre-idea, which made you an outlier at the time. In that sense, you were — and I hesitate to use the word — ‘disrupting’ startup founding and traditional career paths. But now it’s starting to look like the EF model is a ruse to disrupt early-stage venture capital… or is that too simple an analysis? MC: I always remember Paul Graham being asked this about YC clones and saying he felt “like how JK Rowling would feel if someone wrote a book called Henry Potter.” Joking aside though, I think YC has shown that highly defensible network effects in VC are possible. There are literally hundreds of YC clones and yet 95% of the value in accelerators has accrued to YC. I think we’re on track for something similar in the talent investing space. The key way to think about defensibility is at the level of the customer – i.e. the founder. Which talent investor do you want to join? You want to join the one with the highest quality potential co-founders. Which one has that? Well, unsurprisingly, the one with the track record, the best alum, the best network, etc. Once you’ve established that – and EF is 5 or 6 years ahead of the clones – it’s very difficult to catch up and the advantage compounds quickly. TC: You shared some stats with regards the success rate of EF startups and the figures look encouraging. But what we don’t yet still have are many exits. 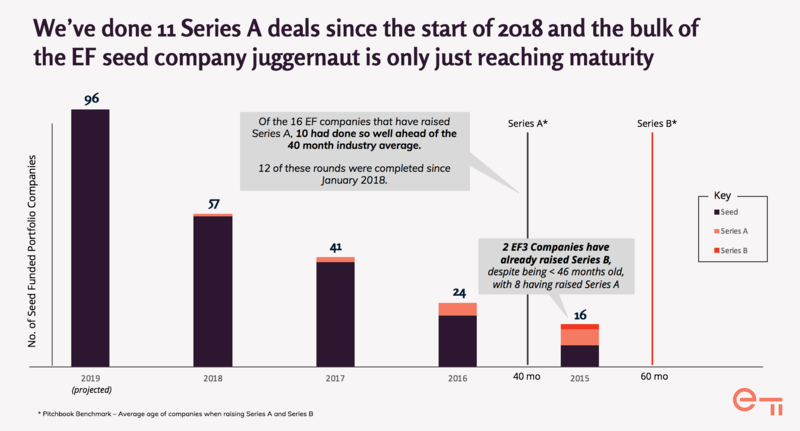 This isn’t surprising given that you invest incredibly early, so it will take time for startups to move through the cycle, but it also means that LPs backing EF continue to take a leap of faith. Is that a fair statement and what was the major pushback you got from LPs that declined not to join EF on this next phase of your journey? MC: Yes, Joe and I spent a lot of time on planes and in the U.S. last year to pitch LPs! The vast majority of the capital in this fund is U.S.-based and, of course, Reid and Greylock are there too. What Joe, Alice and I all believe is that Silicon Valley remains perhaps the best place in the world to scale a tech company, even if it’s no longer the essential place to start one. This means that being able to build relationships with the best U.S. VCs is a key competitive advantage for an EF company. We’ve already seen some of this, with Insight leading Tractable’s B round and Founders Fund leading Massless’s (EF LD9) seed. But Joe being there full time is an ideal way for us to accelerate this and I think you’ll see a bunch of EF companies raise U.S.-led B and C rounds this year. The key is the right capital at the right time.